If you know the name Gareth Evans, it’s probably because you’re a fan of the meticulously choreographed, almost impossible to comprehend martial-arts sequences that defined his breakout features The Raid: Redemption and The Raid 2. Born in Wales, Evans made a name for himself making action movies in Indonesia — really the exact path you’d expect from a young boy in the Welsh valleys who dreams of filmmaking one day. His latest picture, Apostle, is his first English-language feature since his debut film in 2006, and it stars Dan Stevens as Thomas Richardson, a man who goes off to retrieve his sister after she is abducted by an island-dwelling cult led by Michael Sheen’s Prophet Malcolm. Set in the early 1900s amid a provincial settlers’ colony, Apostle is the kind of movie you can smell, and even though Evans wanted to get away from the combat spectaculars of his Raid films, his training in action has helped hone a keen eye for shot sequencing. 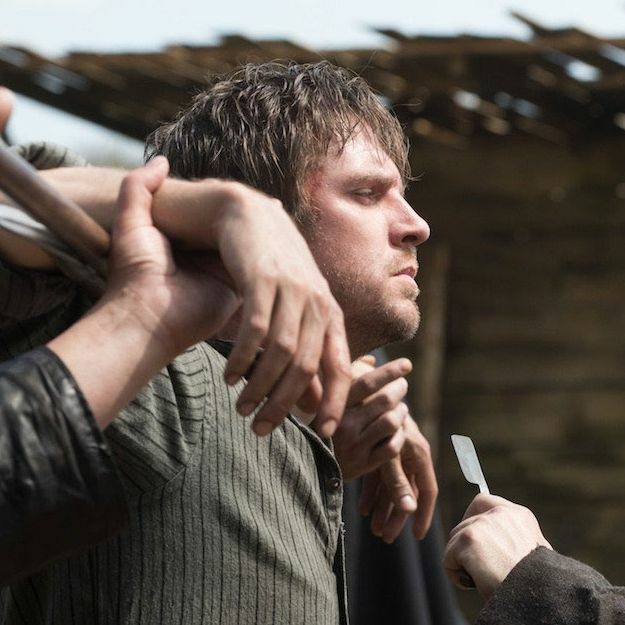 When the intensity ramps up in an Evans film, you feel immersed in the scenes, and in one of Apostle’s most savage runs, that deft hand is on display as Stevens fights with a basket-headed man they call the Grinder who’s trying to run him through a — well, through a meat grinder. “I didn’t want to make an action film for sure,” says Evans of his folk-horror story, which draws inspiration from British occult horror classics like The Devils and The Wicker Man. “I said to [Dan] from the get-go, ‘You’re not going to be doing action in this movie. You’re going to endure a lot.’” And endure he does. The mangler scene was shot over multiple days, during which dozens of seconds-long shots were filmed to be stitched into one grueling battle. Stevens spent much of it covered in fake blood and actual mashed bananas that were painted onto his body to make him appear coated in grime. To get a fuller understanding of how it all came together, Vulture spoke with the star and the director about filming a fight scene that’s built for a horror movie instead of an action one. Here’s how that brawl came to life. “I’m known for doing sort of martial-arts films,” says Evans. “So usually when it comes to choreographing a sequence of action, you’re bound by the limits of the human body. It’s punches or kicks or weapons-based scenes, and it’s very straightforward sometimes, because there’s only so many ways you can punch, kick, throw, and block.” In the case of the mangler skirmish, the blocking revolves around a simple death contraption that Stevens characterizes as a kind of meat mincer. And going up against his basket-headed opponent, the character of Thomas ends up in more of a street brawl than a smooth fistfight, getting roughed up on a man-sized table as a witch’s imp attempts to turn him into ground beef. The threat of mortality is especially credible, too, considering by the time the mangler scene comes around, you’ve already watched a man get his brain cored out with a hand-cranked drill. Even if Thomas makes it off the table alive, you get the feeling he might have to sacrifice a limb to make it happen.